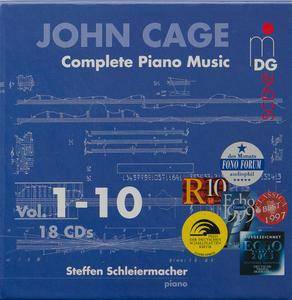 Steffen Schleiermacher's monumental traversal of the complete piano music of John Cage will be essential for the collection of any fan of the composer's, unless he or she has already purchased the previously released ten volumes (a total of 18 discs) that are boxed together here and reissued in recognition of the composer's 100th anniversary in 2012. The 20-hour compilation is a testimony to Cage's hugely prolific output, and certainly constitutes one of the most significant collections of keyboard music of the 20th century. 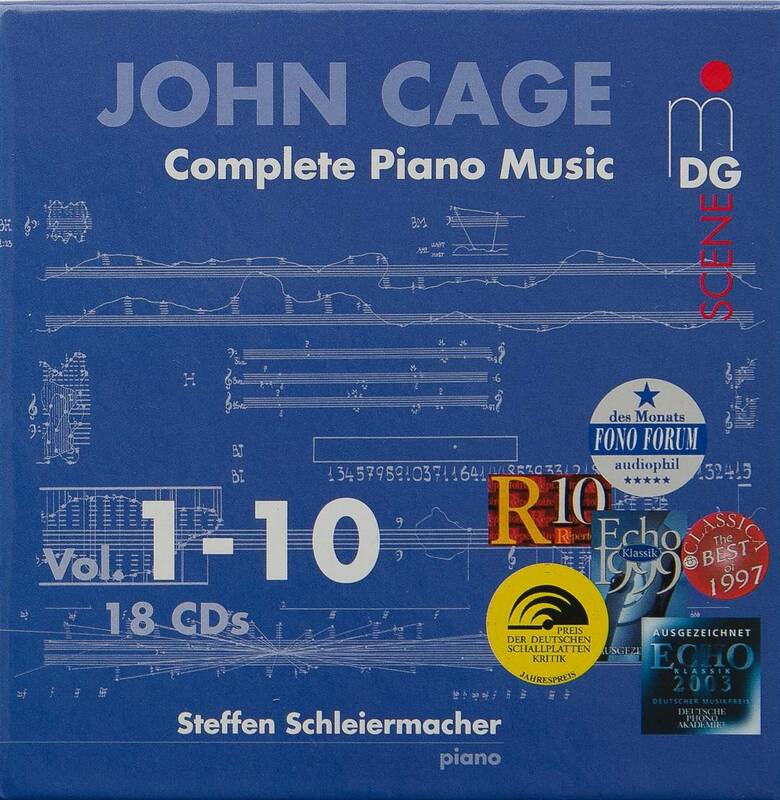 There could hardly be a more sympathetic and skillful interpreter of Cage's oeuvre than German pianist/composer Steffen Schleiermacher. Much of the music was derived from chance and other pre-compositional procedures, and in an indifferent performance can sound random and meandering, but Schleiermacher consistently brings an acute sensitivity, intelligence, and sense of direction to the scores. Cage often allows extraordinary freedom to the performer; in some cases, as in Music for Piano 21-52, he offers only written instructions outlining certain procedures and parameters that require the performer to write the music him/herself. The marvel of Schleiermacher's performances is the consistency with which he takes advantage of the composer's assumption that the pianist will use the sometimes-skeletal notation to personally discover and convey meaning and beauty in the music's execution. 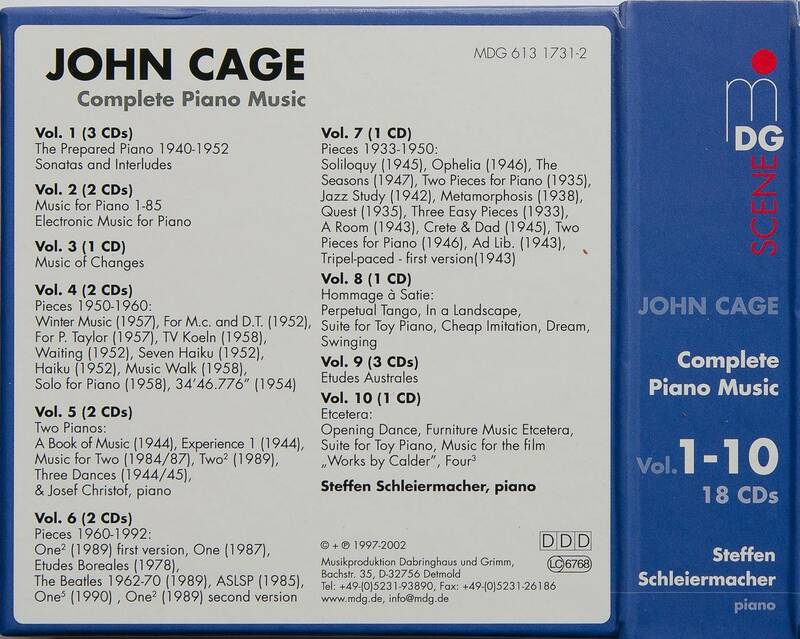 A few of Cage's piano works, such as Music of Changes, Sonatas and Interludes for prepared piano, and Études australes, fall within, or at least on the fringe of, the standard repertoire of the avant-garde, but these pieces are unlikely to be familiar to any but the most ardent devotee. Volume 10, in fact, includes several works discovered by Schleiermacher that are recorded for the first time. The density of some of the music, to say nothing of the length of the set, makes it unlikely that the listener will want to listen straight through, but there is plenty of variety in the selections. Some discs are devoted to solo piano, but some use the opened-up aural spectrum of the prepared piano, and there are works for piano ensembles, the largest of which uses ten of the instruments. In some of the pieces, the performer is also called on to play other instruments, including radios, whistles, sticks, playing cards, and assorted percussion. Each of the ten volumes is logically arranged to cover a theme or chronological period. MDG's unprocessed sound is characteristically first-rate – clean and detailed, but warmly resonant – but the recordings were made over a period of years, between 1997 and 2002, so there is some variety in ambience.